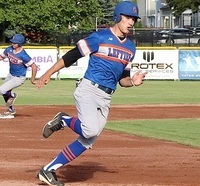 The West Coast League's Moss Adams Player of the Week and Pitcher of the Week, as announced by league commissioner Rob Neyer, are Virginia Tech junior-to-be outfielder Dalton Harum of the Port Angeles Lefties and VCU senior-to-be pitcher Curtis Bafus of the Wenatchee AppleSox for the week of July 2-8. Harum, who is third in the league in hitting with a .333 batting average, went 11-for-21 with 6 runs, 3 homers and 7 RBIs. For the summer, Harum has 7 doubles and 5 home runs. This past spring as a sophomore, Dalton blasted 11 home runs and collected 54 RBIs while hitting .378 at Wenatchee Valley College. Bafus tossed 13 innings over two starts this week, and only allowed one earned run while posting a 1-1 mark and striking out 11. This summer, Bafus has made 6 appearances, 5 starts and logged 36.2 innings for the Sox. 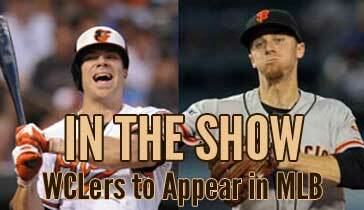 He is 3-3 with a 2.95 ERA while striking out 34 and walking only 9. As a junior with VCU, Bafus went 2-1 with a 3.81 ERA and one save over 16 appearances, 2 starts and 28.1 innings pitched.